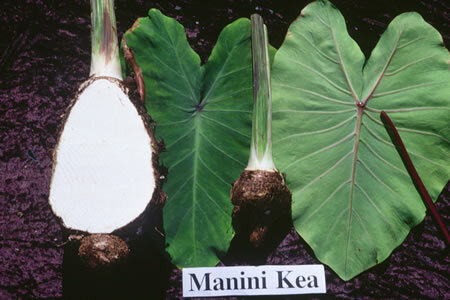 General Characteristics: Medium in height to tall, well spreading, maturing in about 12 months, producing from 5 to 10 oha; distinguished by very light-colored petioles with indistinct reddish-purple stripes. Petiole: 65 to 90 cm. long, shading from light green to yellowish-green toward apex with a few indistinct, more or less interrupted reddish-purple stripes more prominent toward base, conspicuously reddish-purple at apex, an area of white for 3 to 5 cm. above base, with inconspicuous faint pink to whitish edge. Leaf blade: 40 to 50 cm. long, 30 to 35 cm. wide, 30 to 40 cm. from tip to base of sinus, sagittate, thin in texture, drooping, dark green with bluish cast; piko purple; veins purple on lower surface of lobes; lobes acute with narrow sinus. Origin, and derivation of name: Native variety; probably called Kea because of very light petioles. Distribution: Planted in a few scattered localities, under upland or wetland culture. Remarks: This variety seems to be fairly resistant to soft rot. It is the lightest in color of the striped taros, both basically and as to stripes, which are, strictly speaking, minute fleckings arranged in definite, narrow lines.